My Dad passed me down his old blue ’37 Ford V8 4-door sedan with white sidewalls. The image to the right is of a black coupe, but the front end was identical to this one. It got 15 miles to the quart of oil, and was always followed by a great cloud of noxious blue-gray smoke. Of necessity, I carried 10-quart metal cans of oil in the trunk. Sometimes I collected used drained crankcase oil from Roger’s Garage, but usually I had to buy it new from R&S on Park Avenue. The big red rectangular cans collected in my trunk. I was known as the Mosquito Exterminator. No one dared to follow me closer than a block or two behind. Since my license plate number unfortunately started with “BMV,” my buddies also called my car the “Bowel Movement Vehicle,” short for “S–t Heap.” I had to carry at least two spare (reconditioned) fuel pumps as they gave out about every 200 miles or so. The engine block was covered in grease about an inch thick. The choke often malfunctioned. Sometimes I had to take off the air cleaner and prime the carburetor with gasoline just to get the car started. Once the gas caught fire and thank God I was parked near some soft sandy dirt and I was able to put out the fire before it got too big, by throwing the dirt on the engine. Of course some of the dirt went through the open carburetor throat and got into the cylinders and that was bad on the rings. It did increase my exhaust output, though. One afternoon, I drove to a Gaels football game at Rutherford Field. I tried to dispose of about 10 or twelve empty oil cans in a vacant lot near the field, and a neighbor lady saw me and threatened to call the police. Of course, I sheepishly re-loaded the trunk. After the game, I drove Don Scanlan and Neil Reardon and Skip Conway for ice cream or an “Awful Awful,” at a place up on Valley Road in Clifton. On the way, the Ford ran out of oil and we stopped near a florist/greenhouse that was closed and dark, but had a brightly lighted sign out front. Since it was a new can of oil, the seal was hard to open without tools (they were buried in the trunk under all the empty oil cans), so Don was kicking around in the driveway looking for a sharp stone. Suddenly a kid with a big shotgun appeared out of the shadows. His father had already called the police because they had recently been burglarized, and they had been on the lookout for the thugs. He was scared stiff and shaking as he held the gun on us, and we were in worse condition than he was! When the cops arrived (several cars) he and his father pointed out a knocked-over flower pot inside the (locked) greenhouse, and said we were trying to steal something. We were taken to the police station. One cop drove me there in my car. He did not know how to use the stick shift, at least not this one. The gears were grinding—the clutch slipped and was burning, the motor was racing and the inside of the car filled with smoke as he pulled onto Route S-3. Once we got to the station, the cops tore the car apart, scooped the contents of the glove box out on the floor and even pulled out the front seat, looking for evidence, leaving the doors open and papers blowing all over the police lot. Meantime, Don called his father, who raised all kind of hell with the cops, saying they could be doing better things than harassing “good kids,” what with all the rapes and murders going on. I pulled rank by telling them that I was a friend of Rutherford Police Chief Eddie Bigelman, and that I lived in his old house. It carried no weight whatsoever. 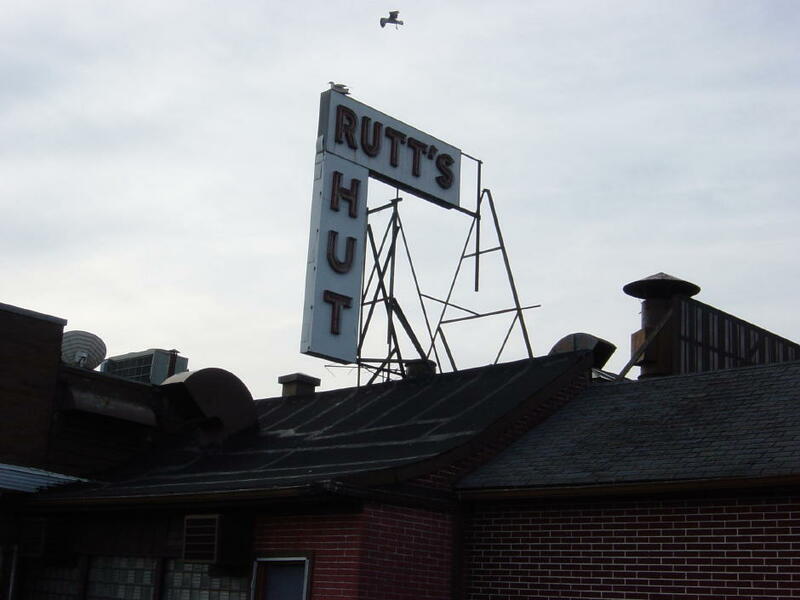 By the time the police let us go it was late, but we were really famished, so we decided to go to Rutt’s Hut and down a Marvis and a couple of rippers on the way home. Near Rutt’s we passed a dark and closed gas station that had a sign “we buy used oil drums.” So, naturally, I pulled in and figured I would make them a gift of my empty cans. I opened the trunk and piled the cans in a neat pyramid on the gas pump island. Just as I put the last oil can in place, Don yelled “CHICKIE, THE COPS!” I quickly began replacing the oil cans in my trunk, as I didn’t want to be charged with illegal dumping. Of all the luck! It was one of the same cops who had arrested us earlier that same night! There we were, right next to the sign that said “we buy oil cans,” stashing several in my car. One of the cops said “Not you again!” Well, the good thing about it was that the cop thought we were stealing gas. They opened each can and sniffed, then let us go. We went home hungry. December 19th, 2006 at 5:42 pm Boy ! you hung around with a bad group-glad I wasn,t influenced by them ! Ha Ha ! Just, Pete Polomski (aka DAVE PALMISKI) courtesy of beloved COACH MORAN. ps.I read of recent death of COACH ARMAND LEMBO. MERRY CHRISTMAS TO ALL !! !